I just went through these tonight.. trying to make a one-stop shopping for tail light questions because there have been so many recently.. The first installment. If you notice the brake/parking lamp arrangement, you'll see why one bulb has to be modified for LED bulbs . For some odd reason GM changed the pinouts, I think just to **** people off that were putting in LED bulbs. 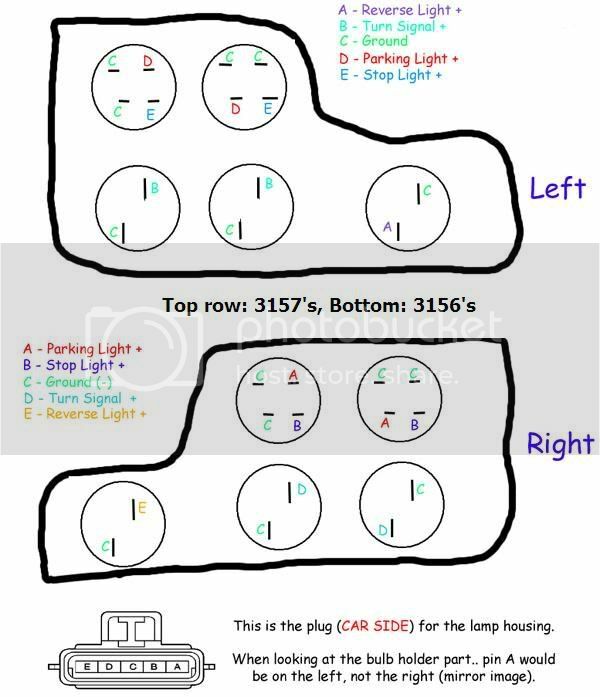 The correct pinouts are for the parking lamp to be on the opposite side of the bulb as the stop lamp, shown correctly in the top left bulbs in both housings. Anyways just a good FYI in general too. Here it is. Last edited by iceman; 05-16-2003 at 09:22 PM. I took apart the housing too.. this is what the inside looks like for anyone wondering. Last edited by iceman; 05-17-2003 at 03:08 PM. When I went to get fresh bulbs for the thing, I just unplugged the assembly, unclipped and carried the bulb holder portion to the desk. (Almost convienient in that regard. If only the other lights were that way.) Being noobish to a particular design quirk, I had trouble spotting burnt out bulbs and thought that perhaps something was wrong with the assembly piece. Turns out the particular bulbs used in these tail lights have fused connectors and *THEY* will typically burn out before the filament. After pulling 'em out, it's pretty obvious which are bad as the base gets melted. Also there are two types of bulbs iirc, signal/brakes have dual filaments and reverse have the single filaments - other than that they look the same. BTW, how easy/hard is that part to take apart and put back together? I've gone to replace another bulb, but this time one of the contacts was corroded to hell. (The bulb itself is fine.) Figured the circuit might even be open somewhere on the inside, but I would have to get it apart first. I have a 2003 GAGT and the first thing I tried was replacing the regular tail lights with replaceable LED's. It blew my fuses... I put the originals back in and haven't touched it in a year. But after reading Iceman's message here, I might have to take this to a deeper level. ie: meter the pinouts, follow the runs to see what is really happening in there. So Iceman, are you sucessfully running LED taillights now? do grand am GT tail lights fit a grand am SE??? i want to put GT tail lights on my 99 SE but im not sure if they will fit? can you help? Do you have to buy an entire back light panel to replace one burnt out bulb? or can you just take it out and replace the bulb? I can't find the actual bulbs anywhere. your kidding right they are just 3157 or 3156 bulbs. theres like 5 or 6 clips that hold the panel that has the bulbs in it to the tail lights. Updated Seth's diagram for quick reference of what bulbs are where. I have after market LED tail lights in my car and they have worked just fine - not blowing any fuses or burning out anything in the tail lights what so ever. One thing that did happen though was my cruise control stopped working when my head lights turn on, whether it be from the automatic daylight sensor, or if I manually switch them on. Could that be because of this issue? dont led tails use 1156? I know this is an old post but what color is the positive reverse light wire on the drivers side? I am trying to hook up a reverse camera and need to tap into it? And is the black wire ground please? Thanks! The ground is green and is in the center of the plug. The reverse positive will be E) reverse light or A) reverse light depending on the diagram of the left or right tail light.